The Joint Congressional Committee on Inaugural Ceremonies announced today that Yale poet and professor Elizabeth Alexander will read at the swearing in of President-elect Barack Obama on January 20th. The Washington Post quotes Alexander: “I am obviously profoundly honored and thrilled. . . . Not only to have a chance to have some small part of this extraordinary moment in American history. . . . This incoming president of ours has shown in every act that words matter, that words carry meaning, that words carry power, that words are the medium with which we communicate across difference, and that words have tremendous possibilities and those possibilities are not empty.” Alexander recently discussed Barack Obama and American poetry on a Poetry Foundation podcast. Elizabeth Alexander is the author of collections of poetry, including American Sublime (a finalist for the Pulitzer Prize), Antebellum Dream Book, Body of Life, and The Venus Hottentot. A collection of essays, The Black Interior, was published by Graywolf in 2004. She is a professor in the African American Studies Program and the Department of English at Yale University. For more information about Alexander and her work visit: http://www.elizabethalexander.net/home.html. 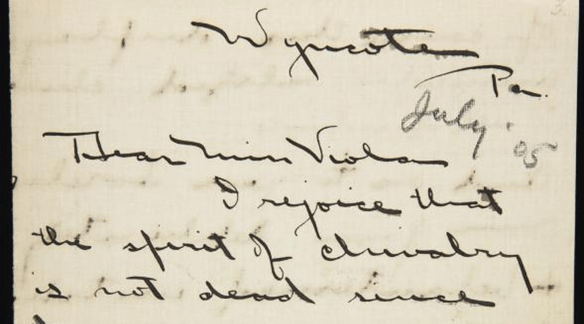 The correspondence of Viola Baxter Jordan is now being added to the Beinecke Library’s Digital Images Online database (Viola Baxter Jordan Papers, YCAL MSS 175). Jordan was a mother of three in Tenafly, New Jersey who maintained a fifty-year correspondence with her former teenage acquaintances Ezra Pound, H.D. and William Carlos Williams. Jordan continued to send letters and parcels to these poets and their families throughout her adult life. The correspondence includes letters from Bryher, Florence Williams, Dorothy Pound, Olga Rudge, and Erza Pound’s daughter Mary de Rachewiltz. This collection documents the personal lives, professional projects, and political opinions of Jordan’s author friends. For instance, Bryher (whom Jordan didn’t meet until after World War II) writes, “I was interested that you thought my writing feminine…nobody ever has. I take no pains one way or the other, but always get referred to here as Mr and have heard people say in journalistic circles that I must be a crabbed old gentleman!” (1942 July 29). In their letters, H.D. and Jordan share a curiosity in astrology, mythological figures and other “’psychic’ interests” (28 July 1942) but H.D., apparently concerned with her reputation, originally asked Viola for confidentiality about her enthusiasm for horoscopes (24 May 1929). Ezra Pound’s letters change most drastically over time. As a student at the University of Pennsylvania, he sends neatly penned letters bragging of his “ability to discourse learnedly about subjects [he has] neglected to prepare” (23 November) and encloses postcards of the campus. Later, from Rapallo, Italy, he writes highly stylized, reactionary tirades on letterhead featuring the Fascist calendar year and a Mussolini quotation. His letters from St. Elizabeth’s Hospital in Washington, DC, where he was sent following an insanity plea at his treason trial, show shaky lines and crooked stamps. From St. Elizabeth’s, Pound implores Jordan to “go on writin don’t wait for me to answer” (19 February 1946). On 30 March 1912, William Carlos Williams suggests to Jordan, “oh charming creature of transparent contradictions, let us fly away and be united in impossibilities” in a letter signed “yours quite seriously.” Five months earlier, Williams had revealed he was in love with four women simultaneously: Viola, two women in Europe, and someone “at home” (15 October 1911). He married Florence “Flossie” Herman in December of 1912. While the Viola Baxter Jordan Papers add depth to the existing textual record of her more famous correspondents, they ultimately raise questions about Jordan herself. Who exactly was she? What was her relationship with this crowd? What did they really think of her? Researchers are invited to explore this archival collection in the Beinecke’s digital library as well as in the Library’s reading room. The entire correspondence series of this collection will soon be available in the Digital Images Online database under the call number YCAL MSS 175.